When historic Shapowei harbor was redeveloped into a tourist spot, its fishers were told to stay away. FUJIAN, East China — Since he was a teenager, Yu Longfa has been setting out from Xiamen to catch beltfish and eel. But his career of five decades at sea ended three years ago, when the government closed Shapowei — the harbor he and thousands more fishers called home. “We were told the fishing market was dirty and messy,” the 66-year-old tells Sixth Tone. Now, the freshly renovated port area is filled with artsy shops and pubs, hoping to attract some of the tourists who flock to the subtropical seaside city of Xiamen every year. Shapowei — which means “end of the jade beach” — is a small alcove facing the South China Sea, surrounded on all sides by old, low-slung houses. Missing from the picture, however, is an abundance of fishing vessels. 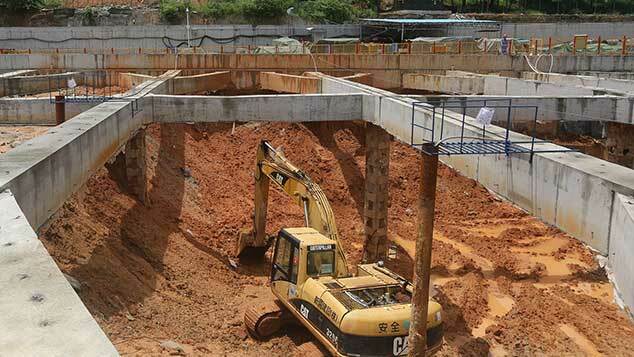 Instead, Yu believes that the government made up an excuse so that it could lay its hands on the area’s prime real estate. 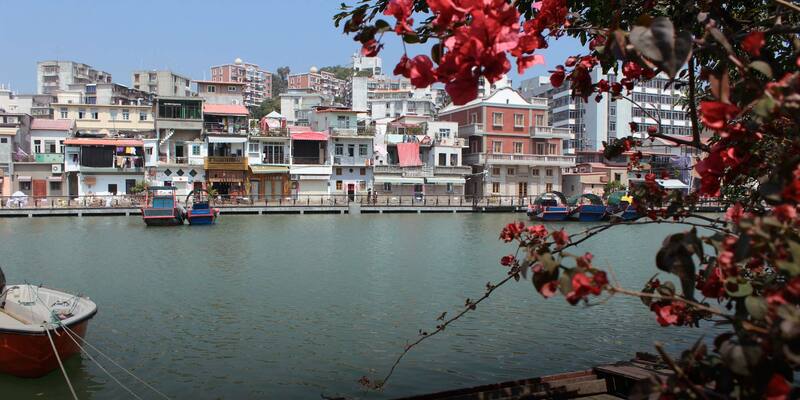 Shapowei is near popular Buddhist site Nanputuo Temple, and historic island Gulangyu is just a short boat ride away. Even the scenic campus of Xiamen University — also within walking distance — is a tourist attraction, to say nothing of the nearby beaches. On May 8, 2015, the city’s Siming district government announced that it would indefinitely close Shapowei harbor to all ships. The city said it wanted to “establish a beautiful ecosystem” — in other words, it spelled the end of Shapowei’s fishing history. Boat owners could hand their ships over to the government and get compensation based on the vessel’s size and power. What added insult to injury for Yu was that he had just built a new boat. When he was out at sea a summer earlier, a collision with a larger ship left his previous boat in pieces. Despite his age and misfortune, he was still set on continuing to fish. But he decided to hand in his new vessel and received 120,000 yuan ($18,100) in return. 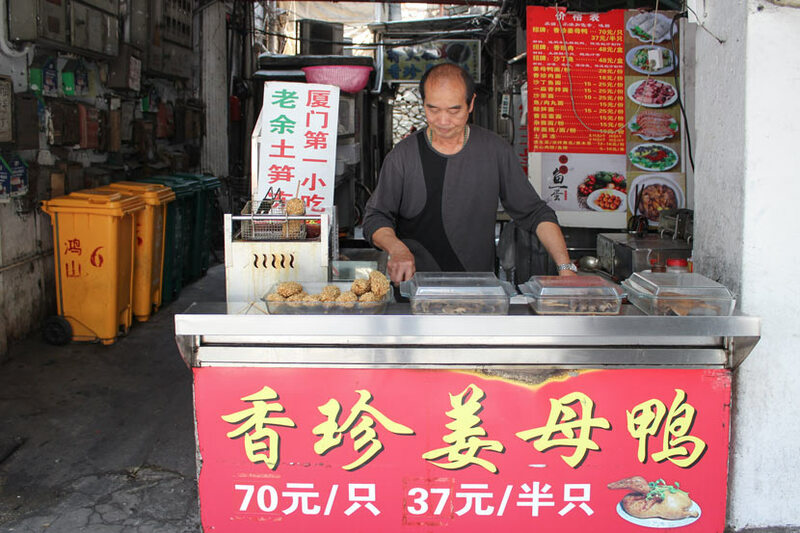 Now, with Shapowei closed, Yu has shifted occupations: He sells Xiamen-style street food such as ginger-flavored stewed duck on a cart near a bus station a few blocks from Shapowei. “The fishers — there used to be nearly 4,000 in total — are scattered around,” says fellow fisher Zhang Tongling. “We are struggling to get by and running out of money.” Now 79, Zhang began fishing when he was 12 years old. He misses the good old days. The period following the Communists’ civil war victory in 1949 — known in China as liberation — was the fishers’ heyday, he recalls. The city depended on them. Day in, day out, the beaches would be covered by fish being dried in the sun. “Before liberation, we didn’t have food or clothing due to the oppression from the nationalists; during Japanese colonization [from 1937 to 1945], we lost our homes,” Zhang laments. “We were miserable then, but we still had the port and the boats. Now who are we? 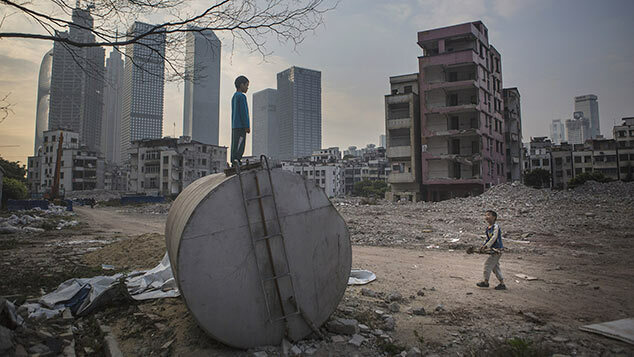 Even a beggar needs a bowl.” Zhang has not taken on other work, and mostly stays at home. His younger former colleagues have become electricians, drivers, or security guards. Others have sailed to faraway harbors to continue their trades. 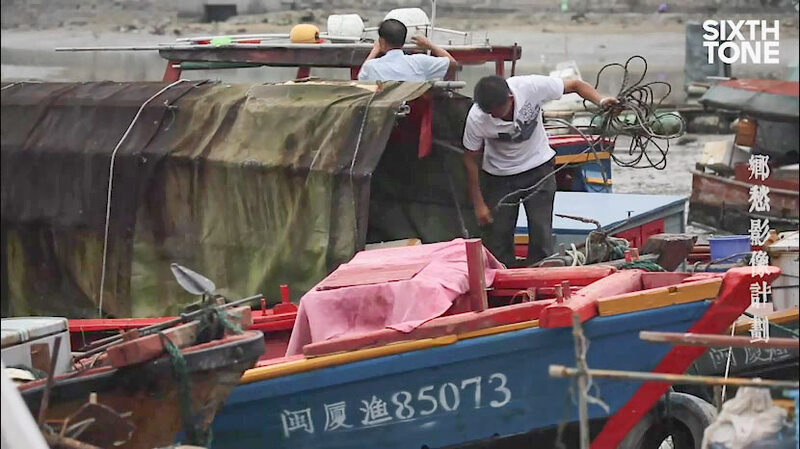 The essence of Xiamen’s port is fishing culture. Without fishing culture, [Shapowei] will never work out. When Shapowei’s fishing industry was humming, it supported a myriad of other companies — a refrigeration plant, a boat repair yard, a cod-liver oil factory, and even a beer brewery. Now, it’s home to artists and small businesses. Pubs tap craft beer, expat-owned restaurants serve up western food, and live houses feature hip bands. On some evenings, skaters take over the square in front of the abandoned warehouses that have since been transformed into an art zone. 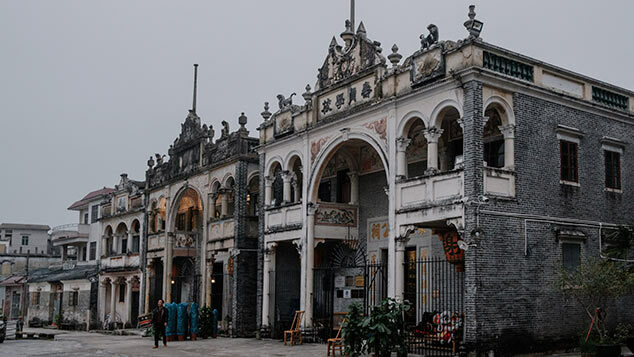 At an antique store across the street from Shapowei, the objects on sale remind visitors of Xiamen’s past — sewing machines, photographs, clocks, and more. 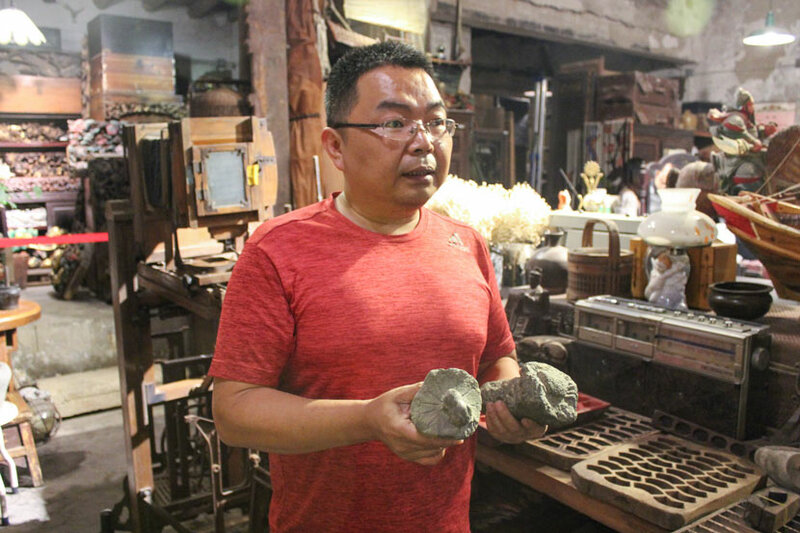 Owner Chen Chaoyuan, who has run the store since 2014, says he’s proud of Xiamen’s history as a seafaring city with western influences from its former status as a treaty port. The 47-year-old tells Sixth Tone that he misses the fishing industry’s former glory. His high school was a short walk from Shapowei. “When the fishing crews came in, almost the entire old town came to life,” Chen recalls. The decision to clear Shapowei of boats upset Chen, who believes that the scruffy vessels were what made the neighborhood attractive in the first place. 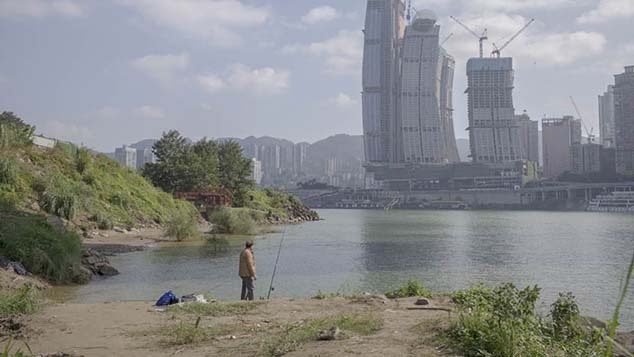 To see fishing culture as backward, he says, “is a sign of cultural insecurity.” At the entrance of Chen’s store hangs a photo he took of Shapowei just before the gentrification project started: a harbor packed with small fishing boats, flanked by old buildings. 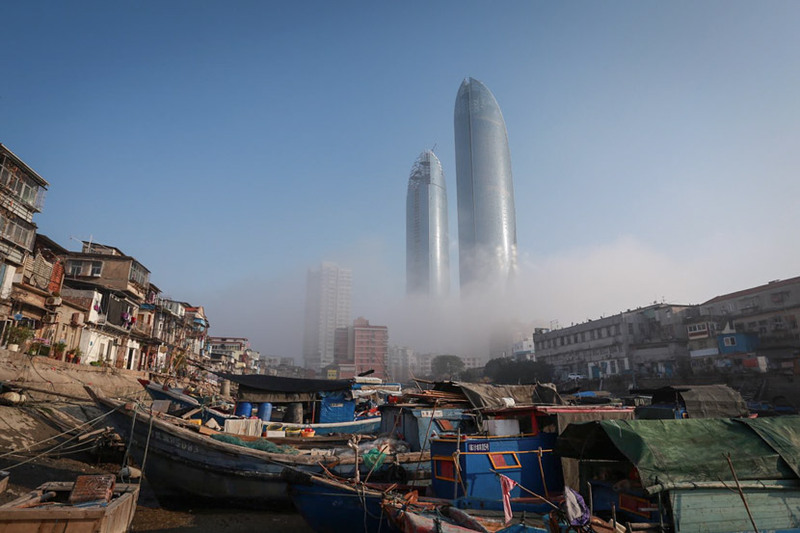 Two skyscrapers — the crown jewels of Xiamen’s modernization — loom in the background. Last year, Shapowei’s Food Castle opened on the site of the old cod-liver oil factory, with five floors of food courts serving traditional local food. During Sixth Tone’s visit on a weekday around dinner time, each floor’s almost empty. “Business is not good here,” Zhong Jinhai, who works at a dumpling stand, tells Sixth Tone. The best time was when the food court had just opened, as the promotions attracted more tourists, he says.